When you think of B2B content marketing, a lot of people think of white papers, research reports, blogs, and case studies. But marketing around a holiday is actually a great time to try out a new type of content. Interactive content is a great fit for marketing around a holiday because it’s fun – we’re feeling celebratory because of the holiday, and a fun piece of content like a personality quiz or contest is a great way to tap into that. You don’t need to create a ton of new content just to tie into a holiday. The first step to identifying the type of content you should create is to zero in on your goal. Are you trying to generate more top-of-funnel leads? Engage your audience on social? Raise awareness around a product launch or event? Surveys, quizzes, and sweepstakes are great ways to engage your audience around an event or product launch. On social, you could try a personality test or trivia quiz (your audience will want to share their results with their friends). To generate net new leads, engage with an interactive infographic or simple poll with a short lead form. Your content will have a different tone based on whether you’re addressing existing customers, warm prospects, or total strangers. This should influence the type of content you choose – is it a fun social-sharing image for broad promotion? A holiday-themed product picker or service comparison chart for bottom-of-funnel prospects? Knowing your audience will also help you align on the messaging for your content. What does your audience care about? Do they think Valentine’s Day is sweet and romantic or silly and frivolous? Based on what your audience wants to see, you can choose a content type that resonates. Let’s get down to brass tacks. How far in advance are you planning for this campaign? If time is tight, you might be best served with a holiday-themed blog post and related social-sharing image. Tools like Canva are great for quick and easy image creation – or try Pablo, a social media image generator just released by Buffer. 4. Is There An Obvious Holiday Connection? 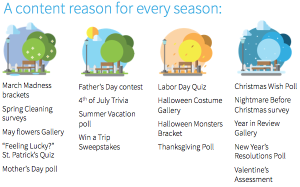 Certain holidays are an obvious fit for a given interactive content type – March Madness is coming up, so everyone’s doing brackets; you could do a poll around spring cleaning connected to your industry, trivia for famous holidays or Presidential birthdays… you name it. Here we’ve listed out a bunch of different examples of interactive content you could build by seasons and holidays – but get creative! There a ton of great content options out there to fit into your holiday campaign. By zeroing in on your goal and audience, planning accordingly, and considering direct holiday tie-ins, you can ensure that the type of content you choose to create will help your campaign succeed. Want to learn more about holiday marketing? Watch our webinar, Modern Marketing by the Seasons! This post originally appeared on the SnapApp blog.